Are you tired of being invisible to your prospects and having to resort to chasing them? to have your business stand out in your marketplace? Are you getting pulled down by commodity comparisons and fighting based on the lowest price? If you identify with any of these questions, then you've come to the right place! There is an opportunity to ensure powerful competitive positioning in a marketplace where clients pay your true worth. You can be in a place where you stand out and have an unfair advantage in your prospect market. You can have a line of clients waiting and wanting to business with you. The secret to positioning is YOU. who lead their businesses by becoming the visible marketing force for their companies. you offer show no appreciable difference from theirs. To succeed, you must do something radically different! 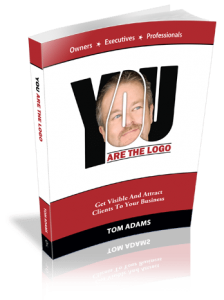 In my book, I describe a compelling opportunity to distinguish your business in the marketplace by becoming its visible, magnetic, personal marketing icon. You’ll learn why becoming the face of your business is important – what you need to do to achieve that – and how to do it with personality. Competition is a major factor for almost every industry. You won't have a successful business just because you exist. You must have a strong and compelling positioning that sets you apart. Becoming the "Logo" for your business is a proven way to do that. I consistently work with business owners, executives and professionals to lead, nurture and guide them to implement effective You Are The Logo™ marketing in their industry and local prospect markets. There has never been a more important time to become the visible marketing icon for your business. The book is available for purchase on Amazon. Please see the links below.